Elegant master suite with large en suite bath, and upstairs bedrooms with private balconies. BRIEF DESCRIPTION: Located in the Legends at Bridger Creek neighborhood on Bozeman’s northeast side, this is a well-appointed three bedroom, two and a half bath home with a lovely front patio and two balconies. 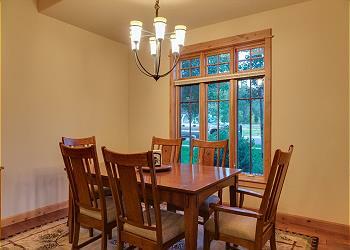 It enjoys mountain views and is located just 2 miles from downtown Bozeman. Trails for hiking and biking, a park, Bridger Creek and golfing are within blocks. A short drive up beautiful Bridger Canyon gets you to Bridger Bowl ski area and Bohart Ranch for cross-country skiing. 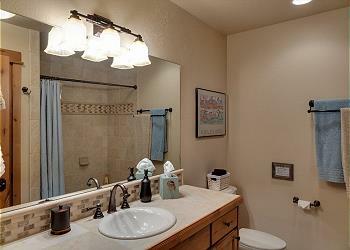 BEDROOMS AND BATHS: The master suite is privately located on the main level. It has a king bed, 40” television, large walk-in closet, and en suite bath with two sinks, soaking tub, and a large walk-in dual head shower. There is an additional half bath on the main level. Two bedrooms and one full bath are upstairs. The Glacier Room has a queen bed and an east-facing balcony with Bridger views. 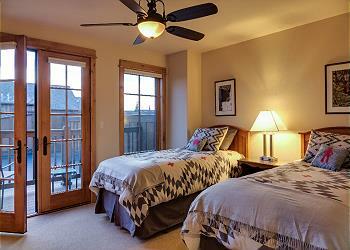 Two extra-long twin beds are in the Teton Room which has a west-facing balcony with distant views of the Spanish Peaks. Each bedroom has two luggage racks, a ceiling fan, and lamps with outlets for charging your devices. DINING AREA: The dining area, with a table for six is adjacent to the kitchen and living room. The kitchen’s bar counter seats four more. Additionally, there is a gas grill and seating on the front patio. LIVING ROOM: Light fills the beautiful living room. There is a gas-fired stone fireplace, large television, a selection of DVD’s, as well as cable service. A cabinet houses a variety of games, puzzles, books and area information. A small adjacent room is perfect for games and puzzles. CLOSEST TOWN AND AIRPORT: You are 2 miles from Bozeman’s Main Street and a 15 minute drive from Bozeman’s Gallatin Field Airport. ACTIVITIES NEARBY: Besides hiking, biking and skiing on “your” trails, you are just across the road from Bridger Creek Golf Course, the best public course in Bozeman. You’re just 14 miles from Bridger Bowl Ski Area and a few more from Bohart Ranch Cross Country Ski Area. There is fishing on the nearby East Gallatin and main Gallatin Rivers, horseback riding, rafting, and everything that the fun town of Bozeman has to offer. Be sure to check out Yellowstone National Park that is an hour and a half away! Thank you so much for your wonderful review of Blue Pine Cone and Mountain Home Vacation Rentals! We are so very happy that you and your group had such a great time at the home. We love hearing that people enjoyed our properties! Let us know whenever you are ready to plan another trip to Montana. We would love to help you find the perfect place for your next getaway. Thanks again and have a wonderful day! Thank you very much for your wonderful review of Blue Pine Cone! We are so glad your family had everything you needed to have a comfortable and relaxing vacation! It is the goal of the homeowner and Mountain Home Vacation Rentals to make sure the home is well equipped, clean and comfortable for every guest. We hope to see your family this summer if you pass through Bozeman! The house was very comfortable, tastefully decorated and had modern amenities. It is in an odd neighborhood, don't expect something quaint.It work well for us while we skied Bridger. Thank you Christy for your review of Blue Pine Cone! We are glad it worked well for your trip and let us know if you are looking for anything different in the future. Thanks so much and we hope to see you again! Clean, spacious, attention to details, beautiful, comfortable, well equipped, every amenity including excellent location for Bridger Bowl Ski Area and downtown Bozeman. This townhouse has it all. Our family enjoyed our week and highly recommend it to those looking for a special stay in Bozeman. It is located in a quiet, family neighborhood close to a trail and stream. Hello Stephanie! Thank you very much for your wonderful review of Blue Pine Cone! We are so glad your family enjoyed the town home and found everything you needed for your stay. We love hearing when people love one of our Mountain Home properties. Let us know when you are planning your next adventure as we would love to have you as our guests again! This is one fantastic place. The Blue Pine Cone is a first class rental and I would recommend it to anyone interested. The unit was well equipped, clean and comfortable. I we are back in the Bozeman area in the future we will consider staying there again. Thank you for your review of Blue Pine Cone and Mountain Home Vacation Rentals! We are happy to hear that you thoroughly enjoyed the home and will hopefully be back to see us! Thanks again!